The blog I did on Cast Member Perks received a lot of positive feedback, so I thought it you might enjoy another blog about working at Walt Disney World. This one will discuss what is expected from Cast Members (who will sometimes be referred to in this blog as “CMs”). It’s fun to work for the Mouse but there are several rules and regulations CMs must adhere to. Prior to being interviewed anyone applying to work at Walt Disney World must take a special assessment test online. Once you have passed that test you’ll be scheduled for an in-person interview. Of course, qualifications for the role you’re applying for are important, but so is your attitude. If you’re looking glum or bored you’re not going to move on. I am sure it will come as no surprise when I tell you Disney is looking for friendly people who smile much of the time. After receiving the thrilling news that you have been hired, all CMs must attend a class known as Traditions before they start working at their role at Walt Disney World. It’s an awesome experience where we learn about the history of the company and Walt Disney himself. Every company has a mission, and at Disney our mission is to create happiness. Most CMs completely embrace this mission, and making a guest happy truly makes us happy. In my opinion the best CMs are the ones that strongly believe in Walt’s Dream of making each guest feel their visit has been magical. I imagine most of you reading this have heard many a CM say “Have a magical day”. And it’s true, we really do want you to experience the Disney magic in every way possible, to go above and beyond your expectations and be part of your happy memories of your visit to the World. I work in merchandise, and it does make me happy to find that shirt you’ve been looking everywhere for, or to have that one pin you need to complete your set. I adore handing out Disney stickers and special occasion buttons to guests. It’s so much fun to see the guest’s excited expression when I call the birthday line and have Goofy wish him or her a happy birthday. In short what makes a good Cast Member is someone who derives their own happiness from creating happiness in others. I don’t think that can be taught, I think you either have that sort of personality or you don’t. But Disney does have techniques to enhance those qualities. It all starts with the Four Keys. If you’ve ever taken the Keys to the Kingdom Tour at the Magic Kingdom the Cast Member leading the tour will often discuss the Four Keys. They were first written by Walt Disney himself and the definitions have been updated over the years for clarification. 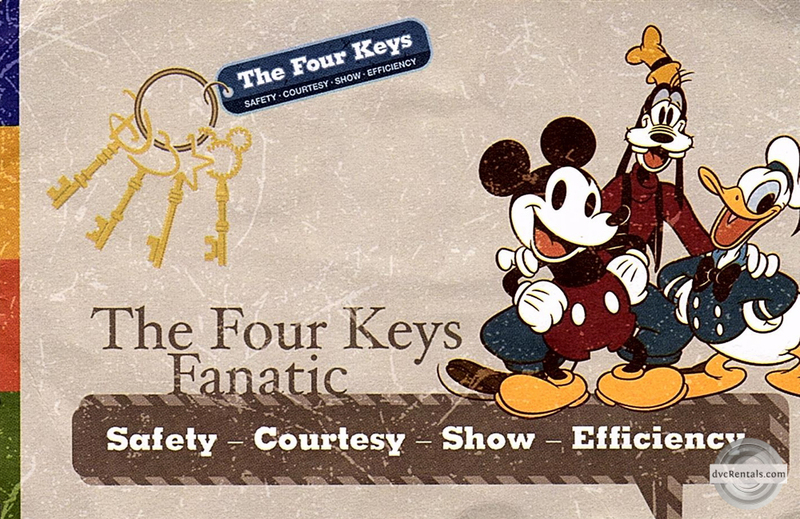 But the four basic keys have remained the same since Disneyland first opened in July of 1955. They apply to every single Cast Member at all the Disney Parks, from the CEO to the maintenance crew. The Four Keys are Safety, Courtesy, Show, and Efficiency. Disney understands that for families to get the most out of an adventure of lifetime, they must first feel safe and protected. By constantly, relentlessly putting safety above all else, no Cast Member takes it for granted. As soon as it rains we put rubber mats out by the doors of shops. If puddles develop you will see yellow caution cones spring up. We are encouraged to report accidents and “near misses”, and are told “If you see something say something”. Sometimes safety means being a little strict, as in telling guests not to climb on dangerous areas, or sit on railings not made for sitting, or not allowing a ride to start unless everyone has their seatbelt on. But we always try to speak to guests in a courteous manner when we ask you to please adhere to our safety rules. Ropes and barriers are not there to make your life difficult. I think most everyone understands, we are not trying to be mean, we are trying to keep you and everyone around you safe. This is not always an easy task when there are thousands of people present (like at a parade or special show). Courtesy is more than saying “please” and “thank you”, although of course we do indeed use those words frequently. Courtesy – in the Disney universe – means going above and beyond what’s simply necessary and looking for opportunities to enthrall our guests. We are always looking to exceed expectations and create magical moments. Disney Cast Members do their best to be aware of guests around them and react to someone in need—whether it be noticing a special occasion or helping someone who looks unwell. 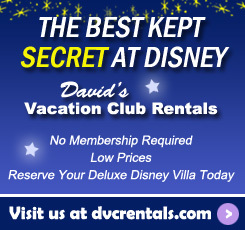 We are constantly searching for ways to make your vacation as awesome as possible. We are always encouraged to comment on special occasion buttons—after all if someone is wearing one, they want to be acknowledged! We are prompted to talk to guests, ask where they are from, how many times they have visited with us, etc. I love talking to guests from all over the world, I’ve met some fascinating people and learned a lot of cool things. As a bonus, I have noticed that if you treat a guest with respect and something does go wrong (i.e. problem with the cash register), the guest is a lot more likely to be patient while you resolve the issue. So, while I am completely sincere in my interaction, it also can have a pay-off if a problem occurs. Notice next time you’re at a merchandise store and you’re waiting on line that you will rarely hear someone call out simply “Next!”. Most of us will say “I can help the next guest right here” (or something along those lines). It’s so much more inviting! We remind you about discounts and ask if you have any that qualify. We offer to send your purchase back to your resort if you’re staying on property, or to package pickup in the park if prefer that. I’ve stopped many a tearful child from crying by offering him or her a sticker. It’s all those little things that add up and make the Disney difference. Disney Cast Members must remain in character at all times. People travel here to get away from the real world and we don’t want to break the illusion of fantasy. Disney requires Cast Members always commit to their roles – whether that role is playing Mickey Mouse or serving your food at a Disney Restaurant. It is extremely important that we are always in costume and that the costume is clean and not wrinkled. If your role includes pin trading it is expected you wear your pins to work. And of course, everyone must have a name badge. If we are on stage, we cannot take out our cell phones or do anything to break the feeling of magic. Nowhere is this more obvious than in the Magic Kingdom, the first park built at Walt Disney World. You will never see someone in Frontierland wearing a Future World costume. That would spoil the illusion. Instead the Cast Member enters the correct “Land” from underneath the Magic Kingdom in a tunnel area called the Utilidors. I am sure you have noticed that Walt Disney World is almost always clean. It is EVERY Cast Member’s job, not just custodial, to pick up trash they may see. If I am walking through a store and I see paper on the floor, merchandise in the wrong place, (or sized in the wrong order) I stop and fix the situation. I never say “that’s not my job” because it IS my job, it’s the job of any CM who sees it. A dirty and or disorganized park/store/resort is not magical. I wonder if you have noticed that you will rarely see a Cast Member leaning on a wall or counter? It looks slovenly, and unwelcoming, so we are encouraged to stand up straight and tall, and look happy and approachable. If there are no guests on line CMs will come out from behind the register and stand in front of it, so there is no “barrier” and makes the guest feel more welcome. We’ll also take the time to straighten out our area to ensure it remains “show ready”. Disney Cast Members are always on the lookout for ways they can make it easier for guests to experience the Disney Magic. Cast Members learn how to quickly solve problems and turn an unhappy situation into a happy one. We listen if you have an issue and try to resolve it as quickly and efficiently as possible. Sometimes we must be very creative to come up with solutions to unusual problems. It is always very satisfying to turn an angry unhappy guest into one who is smiling and relaxed. We try very hard to move the line fast if you’re waiting to check out. Cast Members who are assigned stock positions will come over to help on a register if the line is long. In larger stores, Cast Members will notice a short line and direct guests from a longer line over to the shorter one. If we have a package to send out to a resort, we may wait a few minutes to get the package ready and help a few guests first if the line is long. But that does not mean we rush anyone. When we are with you, you have our full attention! (And by the way that waiting package will still arrive at the resort after 1PM on the following day, holding off a few minutes on sending it won’t effect that package’s prompt arrival). I hope this blog gives you a little more of an idea of what it’s like to be a Cast Member at Walt Disney World, and how we use the four keys to remind ourselves of our responsibilities. One of the coolest things is being recognized for going above and beyond, and receiving a “Four Keys Fanatic Card”. It’s the only picture I have added to this blog, as we are not allowed to take pictures backstage, that might ruin the magic for some guests. I hoped despite the lack of photos you enjoyed reading this and that you learned something new! 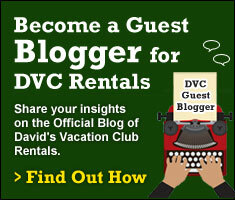 2 thoughts on "Walt Disney World Cast Member Expectations"
Great blog! Thanks for sharing. I’ve never done the keys to the kingdom tour but thinking I will next year. I am always impressed with the CM and we love talking with them.